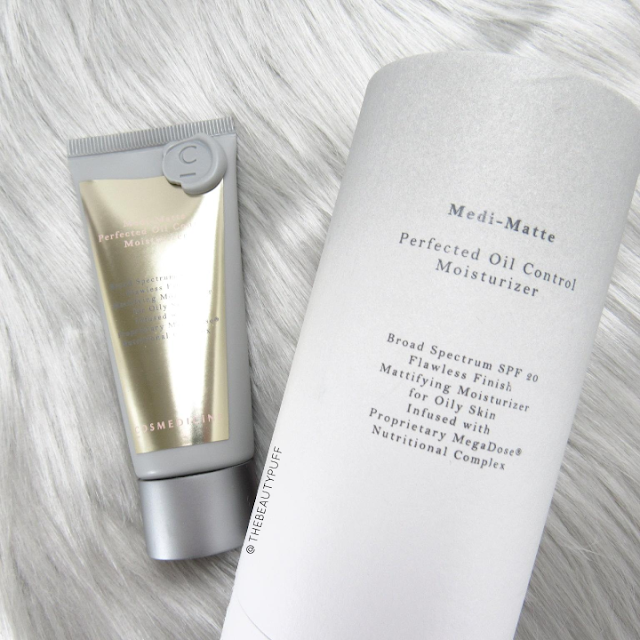 If you struggle with oily skin like I do, you'll love the Cosmedicine Medi-Matte Perfected Oil Control Moisturizer. It's one of the few things I've found to truly control oil on my skin while nourishing and protecting it at the same time. This has become my new summer must-have! Why It Works | The Cosmedicine Oil Control Moisturizer actually liquefies the oil produced from the skin which enables it to evaporate and leave your skin shine-free. This prevents oil from sitting on the skin, causing blockages and breaking down makeup. Protection | While controlling oil, this moisturizer also provides broad-spectrum UVA/UVB protection with SPF 20. Formula & Application | The formula of this moisturizer is almost a silicone-like consistency. It is thick and takes very little to coat the face. I just dispense a small amount and "dot" the product in my t-zone and distribute outward for an even application. Even without makeup on I could see my face getting mattified and smooth as soon as I applied it. Despite being thick, this moisturizer left no residue or heavy feeling on the skin. I followed application as usual with a primer, base etc. Oil Control | Wow. As someone with extremely oily skin who can't find one product to solve the problem, I was extremely impressed with the results! My makeup has stayed fresh, my skin has looked matte, and my pores are more refined so my foundations looked even more flawless. My skin also felt hydrated and comfortable - overall a fantastic balance. If I had to pick one miracle product for my oily skin, this would be it! If you have struggled with oily skin and tried multiple products to find a solution, I highly recommend looking into Cosmedicine. I used their serum in the winter to nourish my skin and now this moisturizer has saved my skin for summertime! I'm a fan for life. You can shop the entire Cosmedicine collection below.